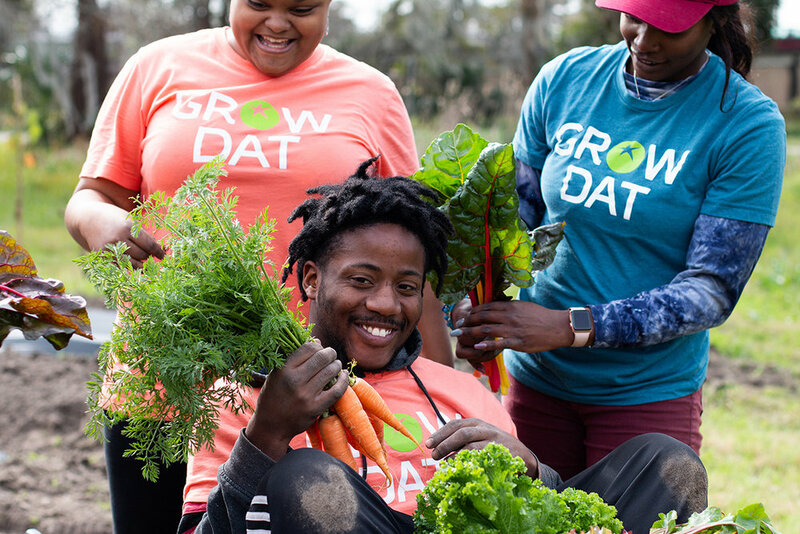 Each spring, from January to June, youth from across New Orleans have come to work on our farm for 5 months of learning how to grow food while developing key leadership skills like public speaking. We work with 9 partner schools and organizations in the New Orleans area. You will be working hard on a sustainable urban farm in City Park learning how to grow fruits and vegetables and participating in workshops about food justice, community leadership, and sustainable agriculture. Each Crew Member is placed in a 12 person crew where you will rotate through time on the field, workshops, field trips, and cooking classes. All Spring 2019 Positions are currently filled. Please check back in the fall of 2019. Fill out the online application or speak to the liaison at your school. If you have any questions email our Program Manager Glenn. The Advanced Leadership program is a 9-month paid position for graduates of the spring leadership program. In the fall, members of the advanced leadership program work on the farm to deepen their knowledge of sustainable agriculture and become expert facilitators by learning to teach our workshops. In the spring, members of the advanced leadership program will become Assistant Crew Leaders and will help Crew Leaders to guide the next group of crew members through the spring leadership program. You are eligible to apply if you have graduated from our spring leadership program. You will be doing many of the same things you did in the leadership program, only this time you are teaching the workshops and leading the farm tasks! It is a great opportunity for youth who are looking for continued employment and an opportunity to continue growing their leadership skills! 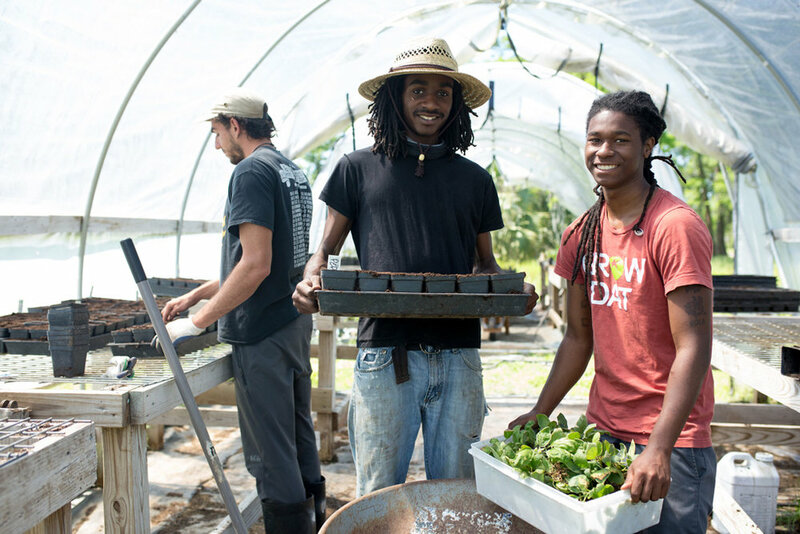 The Food Justice Project is an 8-week program of alumni working to deepen Grow Dat’s relationship with its community, including but not limited to: Shared Harvest Partners, alumni, families, and community members. During their tenure, FJP participants focus on critical analysis and content learning as well as facilitation skills. You will be doing a deep dive into an issue that intersects with food justice, meeting with community members about that topic, and co-planning a project that will assist a community initiative. Previous examples include building garden beds at the First-72 Plus and completing a Grow Dat installation about the intersection of food justice and mass incarceration. The role of FJP Assistant Crew Leader (FJP ACL) is an opportunity to put into practice many of the leadership skills learned during the Leadership Program. The FJP ACL will help guide the next cohort of Food Justice Project Members through the fall program, while serving as positive role models and mentor. The Food Justice Project is 12 weeks long. Meetings will take place on Tuesdays and Saturdays. The FJP members will be responsible for getting to and from Grow Dat and any and all off site venues, unless told otherwise. The members will be held accountable to the Grow Dat Standards System, similar to that of the Leadership Program. The ACL will assist the Field Trip and Alumni Coordinator and the Education Coordinator to facilitate content workshops, openers and closers, activities, and ag tasks. The Crew Leader Fellowship is a part time job for high school graduates 18-26. You do not have to have been a Grow Dat crew member or assistant crew leader to apply. Crew Leaders work alongside and supervise two Assistant Crew Leaders (ACLs) during the fall program. During this time, Crew Leaders and ACLs work on the farm, hone their facilitation skills, participate in workshops around food justice, and help facilitate workshops for visiting groups of college students, adults, and community partners. You are eligible to apply if you are a high-school graduate with a positive spirit and an interest in mentorship, teaching, and ecology. Crew Leaders work alongside and supervise 2 Assistant Crew Leaders during the fall program. During this time, Crew Leaders and ACLs work on the farm, hone their facilitation skills, participate in workshops around food justice, and help facilitate workshops for visiting groups of college students, adults, and community partners. In the spring, Crew Leaders will work alongside the same ACL’s and together they will guide a group of 12 youth through the spring program. This role has significant responsibility.